In the previous sections of this module, we explored how individuals make choices about how to spend their budgets. In this section, we expand that idea to look at how societies make choices about what goods and services to produce. 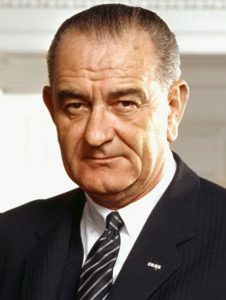 During the 1960s, President Lyndon Johnson attempted two major, costly initiatives: launching the “War on Poverty,” and expanding the Vietnam War. The results were not as nice as he expected because he was unable to completely tackle both issues, and he ignored what economists call the production possibilities frontier (also called the production possibilities curve). In brief, societies have limited resources so they face trade-offs, just as individuals do. The production possibilities frontier (or PPF, for short) is a model of the economy as a whole, which shows all possible combinations of goods products or services that a society could produce, given the resources it has available.